The City of Amsterdam wants all homeless people to participate in a scheme that helps them towards a more stable life. With medical care, day-work, income and health insurance and a place to stay. To enable this, Amsterdam has centralised its approach. Therefore divers organisations are working together. One of them is Veldwerk Amsterdam. Veldwerk Amsterdam is facilitated by the department Onderwijs Jeugd en Zorg (OJZ) of the City of Amsterdam. The daily overseer is the Municipal Health Service (GGD). 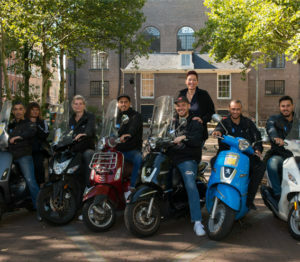 The targetgroup (TG) of Veldwerk Amsterdam are people with so-called OGGZ problems (everything that contributes to their homelessness) and connected to the region of Amsterdam. People without OGGZ problems are given directions (see the brochure under “Directory”) and people without connections to Amsterdam are offered repatriation, national and international. .
1. Bringing the TG to the healthcare organisations. 2. Transport and Accompaniment, only for those that are not (yet) connected to a health care organisation. And in case of an emergency. 3. Cooperation with other organisations. 5. Detecting weak points in the system of healthcare. Veldwerk Amsterdam has no part in counseling. 1. Quick and flexible interventions and mediation where necessary. 2. Steering the OGGZ TG towards the healthcare organisations.